Love That Max : Why is it so hard to find a place of worship that welcomes kids with special needs? Why is it so hard to find a place of worship that welcomes kids with special needs? Monday and Tuesday were the Jewish New Year. I went to temple and prayed to be inscribed in the Book of Life (vastly preferred over the Book of Death). I prayed for good health for our family and friends. I added a prayer for God to continue to give me the strength and smarts to raise Max. And I prayed for us to find a way to include Max in temple. In the past year, I have experienced much frustration trying to find a local congregation that offers services for kids with special needs. It seems like there are more options in major cities, but once you hit suburbia, not so much. Friends have informed me of programs that aren't so close to where we live. Thing is, I would like to find a temple with inclusive services in our neighborhood, where our family can be part of a community we see throughout the year. I don't think this is too much to wish for. The challenges we've faced are hardly unique to our religion; I've heard from parents of other faiths who have similarly felt like outcasts in their congregations. If ever there was a place that should welcome children with disabilities, you'd think it would be a house of worship. But that hasn't been our experience. When we moved to our neighborhood 10 years ago, we joined a temple that had a friendly, down-to-earth vibe. For years, we were content there. We liked the community, the family events they had on the Sabbath and at holidays, the middle-aged couple who ran the children's Rosh Hashanah service with the over-the-top charm of a Saturday Night Live skit. Max didn't join in; he has sensory issues, and crowds and noise unnerve him. So we'd leave him in the temple's daycare during services. Sometimes, I'd attend temple events alone with Sabrina, or Dave would take her. When Max was 8, I grew disgruntled; he didn't belong in kiddie care during services. Sure, he was content, but we could have just as soon left him at home with a babysitter for all the spirituality involved in playing with toys in a nursery room. Max needed a program that would engage him, but not overwhelm him. As I sat in the pews last September and listened to the rabbi's speech about her child's hospital stay and the importance of treating the sickness with kindness, I seethed. It took every speck of willpower I had to not stand up amongst the sea of congregants and shout "WHAT ABOUT MY CHILD WITH SPECIAL NEEDS?!" A friend recommended I get in touch with the temple's head of community to discuss Max's needs. We exchanged messages; finally, we set a time to chat. The day before, she sent an email that said, "I want to be clear that I am not sure what I can provide in light of the financial difficulties facing synagogues." Ooof. I felt as if a door had been slammed shut in my face. To be sure, temples are facing financial challenges. To be sure, ours had just undergone a multimillion dollar renovation (making it more accessible to people with disabilities in the process). How much could it cost to run a service for kids with special needs?! Was it possible there might be a special ed teacher or pediatric therapist in the congregation who could help? Weren't there any options to discuss? I was so put off, I never had the conversation. That's when I first thought about changing temples. A few months later, the director of congregational learning emailed an invite to a summit happening at a temple in another town on building inclusive communities. It was taking place on a Sunday, from 12 to 4. Did I want to go? Um, well, nope: I did not want to be the person charged with spearheading special needs programming. It wasn't that this wasn't a priority for me; it was all the other priorities in my life related to Max. In the last week, my priority was getting Max's blood tested to make sure levels of his anti-seizure medication are OK. My priority was calling his teacher to discuss alternative ways for him to do homework, given that writing is difficult for him. My priority was emailing back and forth with his speech therapist about whether Max might ever be able to articulate the letters p, b, d and k, since he's not yet saying them. My priority was emailing with his occupational therapist to discuss what size t-shirts I should buy so she and Max could practice lifting and them off his head, as he is not yet able to dress himself. My priority was to research a stroller that would look non-babyish for a boy who is almost 10, because Max tires when we walk long distances and he's getting too big for my husband to carry him. Making sure my son can function, encouraging his development, keeping him healthy and enabling him as best I can are my priorities as the mom of a kid with special needs. I would like a temple to make it their priority to include my son, and kids like him, in services. I will be part of a committee, yes, but I am unable to make it my mission. I am already in charge of so much. I am already advocating for Max in many areas of his life. Help us, for the love of God. Me: "Hello! I am calling to find out if you have services or programming for kids with special needs at the temple." Lady on phone: "Not that I know of, dear." Another temple had only an interpreter for the hearing impaired. The majority had nothing. Finally, I got in touch with the congregation that I'd heard had dedicated special needs services. The rabbi seemed warm on the phone. The services, he explained, had been created for kids with autism; no other kids in the congregation had cerebral palsy, as Max does. "Oh, that's OK, Max passes!" I said, laughing. And it's true: Max's speech difficulties and sensory issues sometimes make people think he has autism. This is the temple we went to on Rosh Hashanah. I took Max there beforehand for a quick walk-through; he kept shaking his head "No" (transitions to new places are tough). That first day of the holiday was a madhouse. Max stood outside the temple doors, wailing. He refused to go in. I had my doubts as well; I missed the cozier setting of our old temple. Dave took Max home, Sabrina went to a program for grade-school kids, and I headed to services with my brother-in-law. First, though, I peeked into the special needs service. There were a handful of families, mostly with teens, all participating enthusiastically. I met the woman who runs special needs programming, and she seemed both welcoming and driven to find a way to include Max. We might be able to ease Max in by coming more regularly; there are Sabbath special needs services throughout the year. Once he felt more comfortable, we could possibly coax him into attending events, too. We're lucky he's been part of The Friendship Circle, which provides programs for Jewish kids with special needs around the world. The other choice is do some version of services at home. For Rosh Hashanah, we could read a book, eat apples and honey for a sweet New Year, and get across the key message of this holiday: being better people and treating others with kindness. It's a definite possibility. But I am not willing to give up on Max going to temple, for all the reasons any parent of any kid takes them to a place of worship—and because I would like attendance to be part of our family life. With the growing awareness about children with special needs, perhaps more houses of worship will commit to special needs services and programming in upcoming years, ones geared toward kids with sensory issues and kids with intellectual disability. It is the Jewish thing to do. It is also the Catholic, Protestant, Episcopalian, Islamic and Hindu thing to do. Synagogues, churches and mosques seem aware of the necessity to be physically accessible to people with disabilities. You'd think they would feel compelled to answer to a higher authority when it comes to spiritual accessibility. I sat next to my brother-in-law in the crowded sanctuary, chanted the prayers, sang the familiar melodies. I had some hope. But I felt so very alone. you are not alone We the corvins from starlight starbright are jewish and we belong to a temple in kingston ny where they have exculed my son who has atusim and my other son who is MR so I found a special needs jewish group that has a hebrew school program run by a jewish family services of orange county. And now our kids are welcomed back into our temple with opened arms because I went to the temple board . My husband's family has been memebers for like 30 years and my husband had his bar mitzah there and now his son will too. Sadly, places of worship are exempt from the ADA, so they are not required by law to be accessible. However, you'd think they'd WANT to do it because it's the right thing to do. Although having a celebration at home with apples and honey, etc. is great (we did), the high holidays are all about being together as a community. And no, you should not have to take this on yourself. But even for people without disabilities, walking into a high holiday service can be daunting. It CAN be made less so if the synagogue is a familiar place to hang out. Does your synagogue have a library with a kids' section? If yes, how about going there on a Sunday just to read a book with Max about the holiday? Top the visit off with some ice cream. :-) Make a place in the synagogue a familiar and fun place for him. Take a walk around the place when there are no activities so it's relatively calm and quiet. Let SOMEONE there get to know Max, and Max to know them, so there's a familiar face for him. Make him feel good about being there. The rest will come. Yes, that sounds simplistic, but, it's all about inchstones. Why should doing this be anything different? Shana tova and may you and your family be inscribed for a happy, healthy, joyous, and peaceful new year. Really why should temples, churches be exempt that sounds utterly ridiculous to me. Isn't the problem that different children have different needs? We have a nice service that is aimed at engagaing kids with special needs but it would not be good for a kid with sensory issues. One of the parents there said they moved because their synagogue only offered a good service for kids who had autism and other sensory issues and that it wasn't engaging ennough for her daughter who needed the vibrancy and loud clapping, singing of our service. Another synagogue a few suburbs over offers services for the deaf and my friend who used to belong here joined there. I understand why this can't be your job, but the solution seems to be to find a place that has a service already and make take Max there so that he gets comfortable. Even if your synagogue started a special needs service it might not be right for Max because it might be addressing issues other than his. No synagogue can be expected to address them all. I know just how you feel. Even now when Samuel is 20, it still feels like a struggle. I don't want to chair that committee--I want someone else to care enough to do it. I wish you and Sabrina, Max and Dave and healthy and happy New Year. I was thinking of you on Monday and hoping that you had found a place to be together with your family. L'Shana Tova! Love your comment about how Max can "pass". Put a smile on my face this morning. The new synagogue you visited sounds very promising. And you have much experience at slowing transitioning Max into a new situation. Please let us know how it goes. Sadly I haven't been to church in over two years. I have been a member there for over 25 years. Everybody thinks what I'm doing for my son is great ("I don't know how you do it!" type crap) But they just don't get the fact that I'm (like you) missing a big part of my life, my strength, my faith. Thanks for (yet again) bringing this issue to light. Hi. I'm so glad you have a possibility. Is there a leader or facilitator of the special needs group that might be able to meet you and Max on familiar ground, like your home or the park? Then it would be a familiar face. Also, you could go to the synagogue on your own and find out what happens in the service. Take a long a camera and take pictures as you go to make a social story/introduction book. Pic 1- parking lot with your car in it. 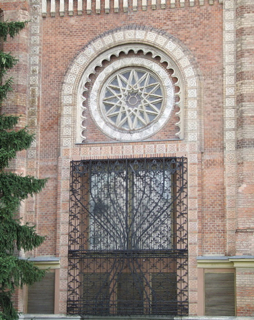 Pic 2- exterior of the synagogue, with a note that "there might be a lot of people. That is OK- My mommy and I know where we are going. Pic 3 hallway/entrance, Pic 4- door to special needs service, Pic 5, service room, and onward with activities, including an aspect of the room he might enjoy. It'll take some time to make the booklet, but once it's done anyone can read it with him and he can look at the pictures on his own. We like to print out pages and put them into sheet protectors in a binder, but you can also make a slide show for the iPad. When we took E. on a flight for the first time, we made this book, read it with him the two weeks before, and then he took it with him to the airport and we flipped the pages as he got to each step so it was familiar. Wishing you a New Year of blessings and progress. I like to think special needs kids are way ahead of the rest of us when it comes to this time of the year. They are continually working on themselves, even when it seems like progress is impossible. I long for a day when posts like these aren't the norm and ones about great and inviting places of worship are, because that'll mean we're finally getting it right. I'm Christian, not Jewish, but you know, Ellen, that inclusion in faith settings is my passion. My husband and I have the privilege - not burden or work - of helping that happen at Providence Baptist Church in Raleigh, NC, and helping other churches do so through our blog (The Works of God Displayed, from John 9:3) and speaking at national ministry conferences. I am encouraged to see more churches opening their doors to people of special needs, but I think we're sadly still the exception. As always, thanks for your insightful post, Ellen! Let me encourage you that in a decade of service in "disability ministry" I have seen forward movement. It may be in inches rather than miles, but it is movement. In Christian churches, a number of us nationally have joined together in our tireless efforts to reach congregations and make the case for inclusion. You are WISE to persist! Thank you for setting a stellar, albeit frustrated, example for others to follow. You are an inspiration to all who look to you for advice. I am Catholic and feel the same way especially about what my priorities are. This was a great post and I think God answered my prayers. I was looking for something to tell me it was okay to put my son and his needs first. I love your blog. I've been thinking so much about this recently, Ellen. Not just for Moxie who has Ds, but for myself, as I'm deaf. I recently went to a Baha'i service (I grew up Baha'i - missionary child to boot!) and I couldn't hear ONE. THING. I felt like crying and wanted to leave but didn't because I didn't want my mom (who was with me) to feel sad. I look at some other places that have captioned services/interpreters and I think they are pretty wonderful. I love it even more when I see people with obvious physical disabilities present, included. So sorry you are struggling with this! Our shul in gramercy park has been amazing with our two LD kids and I can't imagine our wonderful rabbi or education director shying away from any challenge or problem. If you are in nyc and want their contact info, let me know. Good yontif to you and your awesome family. We recently started a special needs ministry at our church. I didn't want to leave and find another congregation - this is our church family. It has been disappointing, to say the least, to have to do all the leg work and to hear stories of families who haven't felt welcomed and included. I sometimes get upset that they aren't doing more and the exhaustion of having to do one more thing, but I think of all the moms and dads exhausted and weary who have gone before me who fought so we have some of the services for my son with cerebral palsy today and I pick up and keep fighting! While our ministry is small - about 10 families - and there are a wide range of different needs we find comfort in knowing others who "get it" and together we dream and pray and though none of it will come soon enough we know God will move mountains and our kids WILL find their place in our church.We are already seeing the lights go on and the church staff thinking differently. It'll be a long road, but so worth it! We haven't been to church for years for this very reason. They would not accommodate our son for lessons nor services. We have to fight for enough things, this should not be one of those things. Ellen - I'm sorry you felt so alone. You are asking the right questions. Doing the right things. It shouldn't be as hard as it is. It is wrong on so many levels. Good luck. I admire that you don't give up. Church is just one more area of the world where people are starting to realize that the disabled population is pretty doggone big. I don't fault any congregation that doesn't have special accomodations, I imagine that it's just because the right people don't understand the need. Fortunately we once got a minister with a real heart for mentally retarded folks, and many in the community knew of him and came because of him. Our church doesn't have an elevator or bathrooms upstairs, so any activities that include my daughter are happily moved downstairs. The leaders also modify any activities and are sure that Kate feels included. Our ministers have reminded the congregation that church is family and families are noisy and messy, so the mentally retarded (MR) members are welcome even when noisy. One teenager with severe CP plays percussion in the band, so whenever he's up there the band is extra noisy. We have a once a month parents night out for families with MR, and our conference has a week long camp for MR. I'm sure that at first these things were uncomfortable for some people in our church, but because our ministers persisted in inclusion (not necessarily a lot of adaptation or special services or things that cost money, mostly just a leadership ATTITUDE) then I think a lot of people have had their eyes and hearts opened - so we are ministering not just to the disabled but to those people who haven't had the opportunity to love someone with a disability. But, in the beginning it took one person in a leadership position to tell the congregation "this is how it's going to be." Oh Ellen, I wish you lived in Atlanta. My synagogue does an excellent job of including everyone. The spirit of acceptance is so beautiful. One little boy with CP had his bar mitzvah recently. The other kids gathered around him and read his parts for him. Everyone was in tears. For us and my kid (cognitive disability), I don't want a "special needs service." I just want my kid included in the regular, old church service, just like everybody else. He can get vocal and restless sometimes in church, and it used to make me feel really uncomfortable and like I was disturbing others. But I've gotten over it. I mean, he belongs there just as much as anybody else - he's one of God's children, too, ya know? Granted, if he were being completely disruptive, we would remove him from the service, but if it's just some vocalization here and there, I figure others can handle it. And if they can't, well, maybe they need to pray about why they're being such jerks to begin with. Our church has tried several times to start a Sunday school class for children with disabilities, and I have always balked at it. I prefer for my child to be included with the typical Sunday school class. It's hard to make it happen, but I've been pretty vocal and involved at our church and have come across wonderful people who have been willing to give of their time to "shadow" my kid during class time. It has been such a blessing to us. Church really should be the ultimate inclusive environment, and shame on them if they're not. Granted, many churches/synagogues just aren't aware of the needs of people with disabilities, which is where we come in. I anticipate our church home to be my son's community for all of his life - where he can truly feel accepted and loved and valued. It's important to me to get him involved and comfortable now - and have others comfortable with him, as well - so that will actually happen for him as he ages. We are lucky to belong to s synagogue that is 'getting there.' they hired an inclusion coordinator for religious school last year, and my son had his Bar Mitzvah there 18 months ago. I blaze the path, but they are willing participants. On this road I have found a GREAT resource, jgateways.com. Their resources pages have amazing, free resources, including social stories for holidays and going to temple. Right there with you, sister. Shanah Tovah u'metukah! Ellen, thanks for sharing this. I don't have any insight to add except for on a purely practical note. Your weekly activities sound familiar, and you mentioned shirts which we've struggled with. Not sure how you're working with Max, but Hannah Andersson boxy ts work well for us as do waffle weave henleys from Lands End or Target (cherokee I think), because the material is stretchy enough and the neck holes wide enough to be pulled off. Good luck on all fronts. Thank you for the support, everyone, and good wishes and suggestions (including the waffle weave t's, Emily; off to look for them after this). I'm sorry to hear some of you have had similar experiences finding a congregation, and happy to hear about the successes. Major props to those of you who have taken it upon themselves to pave the way in your ministries. I've gotten a lot of emails with ideas, including recommendations for programs. Still hoping the new temple works out. Wishing all of you who celebrate the New Year one filled with Good Things. HI -- Someone mentioned to me a book called Vulnerable Communion: A Theology of Disability and Hospitality, written by the father of a boy with autism who wasn't accommodated at church. We've come a long way baby, and we've a long way to go. From the synagogue staff who kvetched about money to the "special" services the missing element is that we are all created in the Divine Image. That spark is present in the eyes of each person and that is the key to unlocking the great attitudinal barriers that this post and all of the comments reflect. That being said, the only thing left to do is to act. We know that. Meaningful inclusion, meaningful participation--points of entry in many different ways. Putting one foot in front of the other, we need to organize differently than we have before. This is not a movement issue or particular to any one institution. Within the Jewish world, change must come from all points. It is, after all, a new year. Time to move beyond reflection to action. It can make all the difference to everyone. Ellen, My heart hurts for you. I too know what it feels like to be turned away by our Jewish institutions. My son passed away 5 years ago at the age of 21 from Duchenne Muscular Dystrophy. In his memory I have started two courses for Rabbincal seminaries. One is on the Rabbinic Role of Inclusion of People with Physical Disabilities and one is on the Rabbinic Role of Inclusion of People with Developmental and Learning Disabilities. My goal is to have these courses as a part of the mandatory curriculum of each Jewish denomination's Rabbinical seminaries. I hope that with time stories like yours will no longer occur because we will have religious leadership that understands it is our obligation to be an inclusive society and that it doesn't necessarily "cost money" to include as part of our people every Jewish child/person. Wishing you, Max and your entire family much strength in the New Year. Thank you. I advocate for disabled persons and it is my contention that the religious bodies should not be exempted from the Americans with Disabilities Act. When we exempt any body from a law, we say that it's ok for them to exclude disabled people. I think we have to start with full and even application of the law, and then one by one we have to educate them how to accommodate us, our children, our parents, our siblings, our friends and all other disabled persons. My daughter and I are both disabled, if you ever want to talk about advocacy approaches or any other issue please feel free. And I know, taking care of the details for a disabled child is two jobs, raising him or her is another. Many hugs. I sincerely hope that the new temple works out for you. We have the same issues with church. We live in a rural area so our choices are few. Like your son, at 14 our daughter cannot just be plopped into the nursery. Seizures and behavior make that dangerous for the little ones. Bethany thinks the couch in the church foyer was put their specifically for her. She plops herself on it the minute we get there and won't get off it or let anyone else sit on it. I have decided to just stay home with her. I can watch her lay on the couch at home. There's just no point in even going! I share your struggles. Where are the allies in our communities? I have been very disappointed by how very little the Jewish community in my area offers for families like mine, especially outside of the Orthodox community. My experience was similar. We joined Kol Ami in White Plains because they said they were inclusive and they had started a Hebrew school class for pre-Bat Mitzvah students with special needs. I never really liked their Hebrew school program - it really provided no inclusion. The "typical" kids were mean and the mainstream teachers resisted any inclusive. When all the 6th grade went to Ellis Island I asked for my daughter to join and the principal said no, "it is not appropriate". I found the clergy reluctant to be inclusive too. We had my daughter's Bat Mitzvah there and the rabbi and cantor did customize for her. But we had no friend there so no one from the temple was invited to her Bat Mitavah. We felt like an island in the sea of congregants. My daughter knew a number of the girls who attended the Hebrew School from her public school. They ignored her. She noticed! She started to refuse to go to Shabbat services. The people who need to be on the inclusion committee are NOT the people asking to be included but the people who are inhibiting inclusion. We resigned our membership and no one really cared why we did. We are temple-less and so alone. Only Friendship Circle is there for us. If they were able to spend millions on a renovation then it seems to me that the overall congregation size must be enough that they could scrape together people with the skill set and willingness to do better by your son. I was a respite care giver for 24 years. I know how hard inclusion is for some places. I watched one place turn away a family with two autistic children because the younger was too unpredictable in his behaviour. His parents so desperately needed at least 90 minutes where they could pray and focus on themselves and not what he might do next. I was entirely willing to take that on but for liability issues was told they would need to go somewhere bigger. Why on earth should families with challenges have to leave a place that is their spiritual home when Torah tells us that's not good enough? The first words out of one persons mouth was why are you telling us this. My heart sank a bit as I thought that was a lead up to some brush off. But the concern of all of them was did I need to tell them because I was afraid they would think less of me. It was such a relief. I was telling them because I knew in all probability the stress of a major life change was about to undo me. It actually wound up being far more catastrophic for me than I expected even but pretty much my entire temple and some of the broader Jewish community was very there for me. It almost makes me cry to think how much they took care of when I could not. I know how exhausting being a parent of or having special needs is or I would say insist your temple do better by you. I hope your new one will. I have seen the attitude you express over and over at churches: "If you want something different, do it yourself.". I understand the theology, but seriously, when you are a super-busy mom, it is simply not that easy. We also need our less social children to be able to transition to a new surrounding/ new people/ new activities WITHOUT us being the ones leading it. It's better for them. Sometimes it's just so much easier to stay our of worship, but really, the church shouldn't be the entity hindering our relationship with God! Parents of special needs children need practice inclusion, not separation. Your family should attend services together, as a family. I have lived with "Special Needs" my entire life, my sister has Cerebral Palsy w/ Spastic Quadriplegia, and it was our family that made sure she was included in EVERYTHING. I couldn't imagine trying to leave her behind or trying to make special arrangements for her. She is part of our family and has always been an active participant in every community we lived in. I think that parents and families need to understand that the only way to make changes is to teach society and be daring enough to include your disabled child in every aspect of daily life. I remember attending services as a kid with my sister when we were younger and she was by far the loudest and most disruptive member but our family never budged and never caved in to alienating her or ourourselves from the community. Over time people learn and accept that people with special needs are part of the community and they have always been accepting of that. Shame on parents who want "Special Needs" to be treated differently. We are all different and have "Special Needs" and I think that we need to stop being embarassed and we need to make sure that we are confident in ourselves about integrating into different communities rather than trying to find a program for "Special Needs". The worst thing you can do is separate your children and label them as different. "Um, well, nope: I did not want to be the person charged with spearheading special needs programming. It wasn't that this wasn't a priority for me; it was all the other priorities in my life related to Max. ".....One of the biggest problems facing religious institutions today. People want something from them, but aren't willing to contribute their own time and effort to make it happen. Everything can't be the responsibility of the rabbi/pastor/reverend/etc. If you want your temple to offer a program for your child, what are you willing to do to make that program thrive. Its like all the parents that drop their kids off at the nursery every Sunday (or whatever day you attend services), but can't take one day out the month to help back there. We need to move past this gimme gimme phase of religious attendance. Where's the need to serve others? Please contact Ginny Thornburgh at AAPD. She is the pioneer in interfaith initiatives for people with special needs. My kid is almost 15 and synagogue going is difficult - he sits pretty well these days though, after an initial settling in phase that can be noisy. What I find interesting is that people say, of course you're welcome but they have no clue how to truly welcome. When I explained to a few people that even entering is hard - that I need people to immediately give us a seat when we enter - we go to a very small minyan in Jerusalem - they were amazed to hear how much this can help us. And that doesn't deal with the rest of the service of course and I'm finished with the children's service - hey, he's 15, how is that the right thing to do for him and/or for me too. I co-founded and run an inclusion program, Shutaf (www.campshutaf.org) in Jerusalem - reverse inclusion - and I've realized from my experience that you can figure it out - that programs can be developed and communities can be inclusive and that money can be found and spent wisely but it's maddening how many Jews are being left off of the communal table - as many as 15% and most likely more when you think of their parents and extended families. It's time for real change, now. We just changed synagogues because their religious school was impossible for my "typical" (man I hate that word) but child who was having behavior issues in class. It became the most intolerant, ridiculous experience ever. And I kept thinking, I'm paying how much for this? This is supposed to help my child learn to love being Jewish? Religion is not always tolerant, even though it should be. And I wish you lived closer to me. Because we found, and joined the loveliest, most inclusive temple ever. And also, we would get to hang out more. Ellen, thanks for writing this post and sharing it on HuffPo. I hope it gets some people in temples and churches thinking of how they can include people with disabilities in the spiritual life of their communities. I pretty much had to give up on Sunday school when my son Tevis was a preschooler, because they frequently had to come find me and take me out of my class because of his explosive behavior (the worst was when he attacked the teacher and broke her glasses). But I am happy to report that, now that Tevis is an adult, he is finally part of a church community. We moved to a house at the edge of a college campus and just 2 blocks from our house is a coffee shop/church ministry for the students and people in the neighborhood. Tevis loves to go there for the Saturday evening service and he had been welcomed with open arms. He recently became a member, and it warms my heart that he has this thing that he does, on his own, as an adult, and that this connection will be there when I am gone. He goes every week and also participates in work days and when they have special events like serving hamburgers and hot dogs to the students the first week of classes. I tell you this story to give you hope that, eventually, Max can find that spiritual community you want for him. Great post! We empathize with every word. We tried the two major synagogues in our community (one Reform, one Conservative) and both were awful. The Conservative teacher refused any accomodations, and insisted that our son finish all the fine-motor arts & crafts projects, turning a three hour Hebrew school session into an 8 hour day (he was told to complete his assignments at home). The teacher ignored him, was rude to me, and the kids teased him. He wore glasses and a brace on one leg and had serious fine motor problems from CP. He began to hate Hebrew School. We pulled him out and on a friend's recommendation, went to our local Chabad with great trepidation---and it was wonderful! Our son was included, excused from arts & crafts frustrations, had in depth Jewish learning, and loads of love from a warm, inclusive and supportive congregation which never wavered, and was never judgmental. Don't give up--it may take time, but there is a congregation out there where Max will be loved, included and accepted! Thank you for voicing the frustrations of many. I hope leaders of all faiths are listening, as they really are very behind in the area of inclusion. The Boy has asked for a few years to go to Sunday School, not really understanding what it's all about, bt feeling like he's missing out on something his NT peers do. I have yet to find a solution. No, Anon, it's not "like all the parents that drop their kids off at the nursery every Sunday (or whatever day you attend services), but can't take one day out the month to help back there." I said I was willing to be on a committee, but was not willing to lead the charge. You are so clearly not a parent of a kid with special needs. Perhaps you will be blessed with one someday, it will surely open your eyes. I'm sorry to hear about more frustrations. Jodi, it would be temple heaven to be at one with you that would be good for all our kids! The outpouring of support I've received for this post (well, most of it) has been heartening. I've gotten emails from many leaders in the field, and I'm going to put together a list of resources and post it here. To the person who recommended I speak with Ginny Thornburgh: Great minds! Someone I know at Easter Seals connected us. I am going to chat with her this week. Ellen, I share your frustration (different religion, similar problems). I think it might be wise not just to ask "do you have a program for children with special needs" but to think about what you really want for Max and what would be most beneficial to him now and in the future. Make a list so you know what you really need that program you're looking for to do. Is it full inclusion? A special class? Something in between? Not every program will be a good fit for every child.